Choosing a motherboard can be daunting. There’s a huge range of options to choose from, each with its own combination of features and technologies. And you don’t want to make the wrong choice, as it’s not something you can easily change. Once you’ve fitted the motherboard into your case, connected all the cables and installed the CPU, memory, drives and expansion cards, it’s generally there for good. Happily, choosing a motherboard doesn’t have to be difficult. You just need to know what you’re looking for, bearing in mind budget and expansion options. Here’s our pick of the best motherboards, supporting both AMD and Intel processors, which have been designed to suit every role from casual web browsing to extreme overclocking. 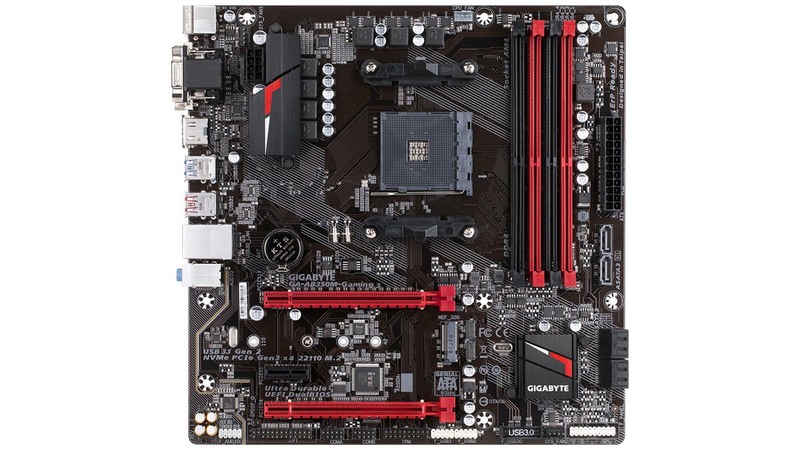 What type of motherboard do I need? That depends on what sort of processor you want, or already have. If you’re planning to use an AMD Ryzen processor, you’ll need a motherboard with an AM4 socket. For Intel, things are slightly more complicated: if you’re buying a Core i3, i5 or i7 processor then you’ll most likely need a board with an LGA1151 socket – except if you’ve got a higher-end Core i7 or Core i9 chip, in which case you might require the LGA2011-3 socket. Just having the right socket isn’t enough, either: the onboard chipset must support the specific generation of chip you’re using. If you’re buying right now, that will probably be one of Intel’s eighth-generation “Coffee Lake” chips, so check for compatibility. Some chipsets are backwards-compatible with older processors – for example, Intel’s newest Z390 chipset is designed for the upcoming ninth-gen chips, but will work with eighth-gen chips that use the same socket. New Intel processors, conversely, tend to work only with the most recent chipsets. 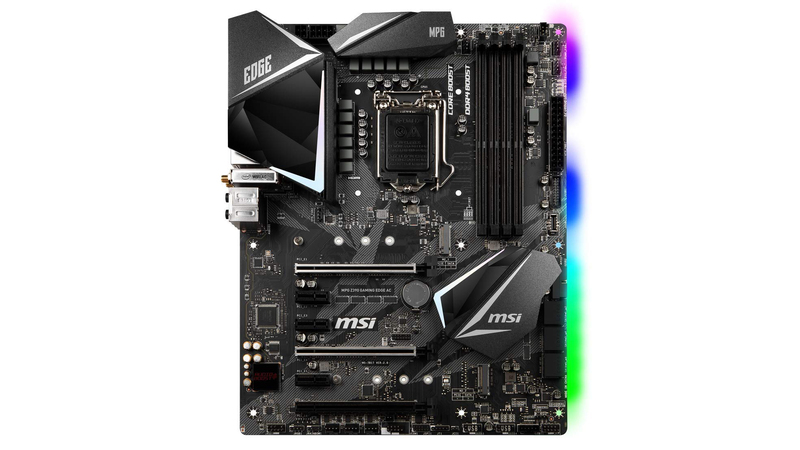 What chipset should I choose? There are lots of different chipsets to choose from, but as long as the one you’ve chosen supports your chosen processor, you don’t need to worry too much about the technical details. The chipset provides various features such as PCI-E slots, USB ports and so forth; just look for a board that provides all the connectivity options you require and you’ll be fine. The only exception is if you want to try overclocking your CPU. For this, you’ll need both an unlocked processor, like an Intel K-series chip or any AMD Ryzen chip, and a motherboard chipset that supports overclocking. All the major AMD chipsets will, but on the Intel side, you’ll be looking at high-end chipsets like Z370 or Z390. We like to see at least four high-speed USB 3 ports, so you can easily connect external drives and other peripherals such as printers, scanners, card readers and so on. A reversible USB Type-C port might also be handy if you have a phone or tablet that uses this connector. Onboard USB headers let you hook up additional ports at the front of your case. Every modern motherboard will also have at least one PCI-E x16 slot, so you can install a graphics card should you need one. Additional slots mean you can add extra controllers, such as a Wi-Fi card if your motherboard doesn’t have built-in wireless. The “x” rating tells you how fast each slot is; you can plug an x1 card into an x4 or x16 slot, but not the other way round. Some high-end boards offer two or even three x16 slots, so you can combine the power of several graphics cards, but that’s overkill for all but the most extreme enthusiasts. Look for an M.2 slot, too, as this allows you to use a superfast NVMe SSD, rather than relying on a slower SATA connection. And check the number of memory sockets: some smaller boards have only two DIMM slots. A board with four gives you scope to add extra modules in the future should you want to upgrade. UEFI (Unified Extensible Firmware Interface) is the motherboard’s own graphical interface, which lets you access low-level settings such as which drive to boot from. If you’re interested in overclocking your CPU, and adjusting the core voltages and fan speeds, you want a versatile, user-friendly UEFI. If you just want to run Word and browse the web, any UEFI will be fine. Indeed, with the rise of software overclocking tools, you can often tweak your core settings from within Windows, so you don’t need to explore the UEFI at all. A UEFI isn’t technically the same thing as a BIOS (Basic Input/Output System), but since they serve extremely similar functions (indeed, UEFI was devised as a more flexible successor to BIOS), the two terms are often used interchangeably. Is the form factor important? Motherboards come in three common formats: ATX is the largest, measuring either 305 × 244mm or 305 x 226mm. Then there’s micro-ATX, at 244mm square, and the smallest is mini-ITX at just 170mm square. They all do the same job, but bigger boards tend to have more slots and built-in features, whereas smaller ones fit in neat, compact cases. Make sure you have a case that’s designed for the form factor of your motherboard. It’s possible to install a micro-ATX board in a regular ATX chassis, but you’ll be left with empty space inside the case, so it’s not an elegant solution. The Gigabyte AB350-Gaming G3 is very affordable, yet it looks good and sports some high-end modern features. You get a full-speed M.2 slot (which also supports SATA M.2 SSDs) and, amazingly, Gigabyte has shoehorned in Realtek’s excellent ALC1220 audio codec too. It has a reasonable number of USB ports, with two USB 3.1 Type-A ports and four USB 3 ports, though no reversible Type-C connector. You even get a USB port dedicated to DACs with adjustable voltage, plus RGB lighting to make the inside of your case look pretty. There are some limitations: the board comes with six rather than eight SATA ports – though that’s more than enough for most people. It also has only two PCI-E x1 slots, and only five fan headers, which is low by AM4 standards. Still, the AB350-Gaming G3 is perfectly capable of getting the best out of a Ryzen CPU. Our test system was perfectly stable out of the box, and we were able to push our Ryzen 7 1700 CPU from 3GHz right up to 4.03GHz (using a 1.425V VCORE). The interface looks a little bland compared to Asus’ efforts, but its new fan-control section is excellent, as is the Windows-based version. There are certainly Ryzen motherboards that offer more in the way of features, but if you’re building a system on a tight budget the AB350-Gaming G3 is a great starting point. It’s tempting to save even more money on an Intel motherboard with the B360 chipset, but this would mean losing the potential for overclocking in the future. 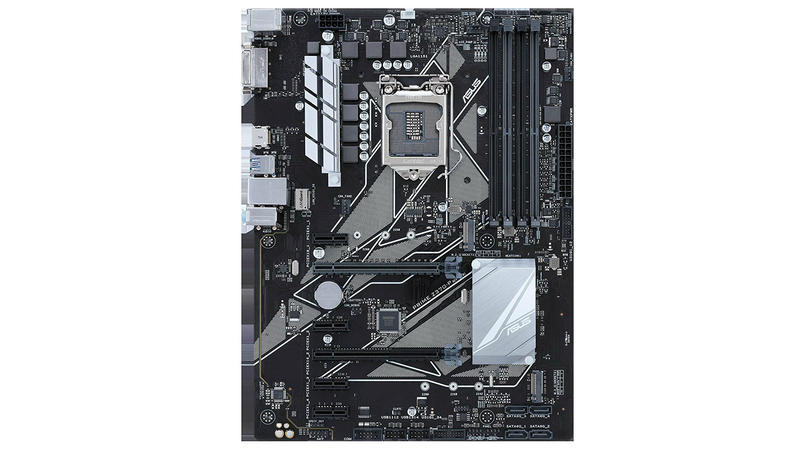 The Z370 chipset provides full overclocking support, so the £108 Asus Prime Z370-P offers a fine balance between premium features and an affordable price. 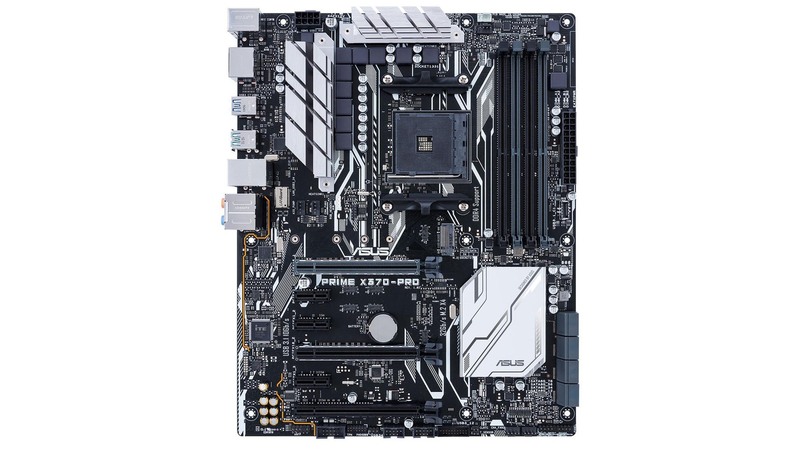 Like its predecessor, the Prime Z270-P, this motherboard makes the odd decision to stick with an old Realtek ALC887 audio codec instead of upgrading to the more recent ALC1220, but you’d struggle to tell the difference unless you possessed both keen hearing and some seriously good speakers or headphones. The Prime Z270-P delivers where it really matters, with a healthy six USB Type-A ports (four USB 3, two USB 2), two PCI-E x16 slots, four PCI-E x1 slots and a full four RAM slots. There’s even room for a pair of NVMe SSDs, thanks to the dual M.2 slots. The total of four SATA ports and cooling headers apiece means there are much better motherboards for building a truly well-equipped rig, but even this is fine for a decent clutch of drives and perhaps an AIO watercooler. If you’re building an overclocked gaming system on a budget, the Prime Z370-P is a good place to start. The Asus Prime X370-Pro uses the X370 chipset – not AMD’s latest, but still a step up from B350 and B450. That means you get an Intel LAN port, as opposed to a Realtek one, and two extra SATA ports, plus Type-A and Type-C USB ports, although they’re USB 3 rather than USB 3.1. Both first- and second-gen Ryzen chips will work, so don’t fret about compatibility either. Internally, the layout is good, with all the SATA ports at right angles to the PCB, and the M.2 slot positioned conveniently above the primary graphics card slot. RGB lighting is a big feature too, with a set of individual LEDs sitting under the audio circuitry. The lighting is subtle, providing more of an ambient effect than an in-your-face light show. You don’t get much in the way of overclocking and testing utilities, but the BIOS is easy to use. The key Windows tools for tuning your PC’s cooling and performance – FanXpert and AISuite – are also included, and these allowed us to get all eight of our Ryzen 7 1700’s CPU cores to 4.025GHz. 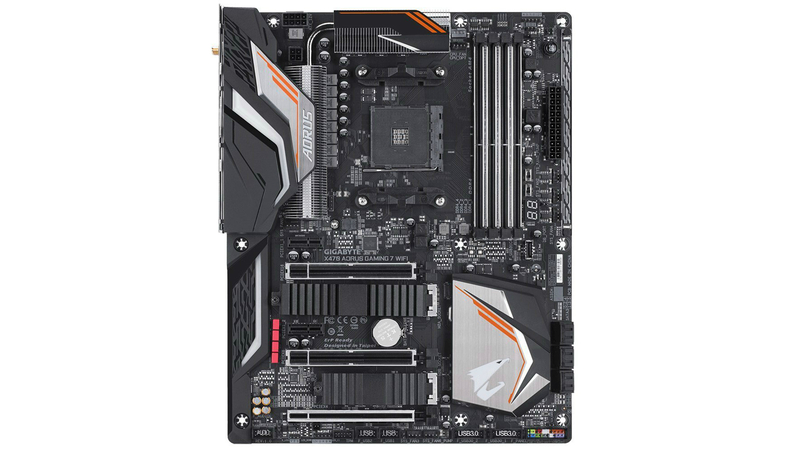 With a competitive price tag, plenty of features, a slick UEFI and excellent fan control, the Prime X370-Pro is an excellent choice for anyone seeking a well-featured but reasonably priced AM4 board. As the name not-so-subtly implies, the Asus ROG Maximus X Hero is a motherboard to be reckoned with. Designed for Intel’s eighth-generation “Coffee Lake” chips, it comes with a host of enthusiast features to justify the £240 price tag. Those include an impressive set of overclocking and testing tools, from onboard power, reset and clear CMOS buttons to Asus’ USB BIOS Flashback feature and an LED POST code display – as well as a good number of fan headers near the CPU socket. In use, it was able to overclock our Core i7-8700K CPU to 5GHz with a VCORE of 1.25V, with temperatures easily tameable by our all-in-one liquid cooler. The standard X Hero lacks built-in Wi-Fi, but if that’s a problem for you there’s a Wi-Fi version too. In all, the Maximus X Hero boasts a great set of features to help you get the best from your new high-end processor. What’s not to like? 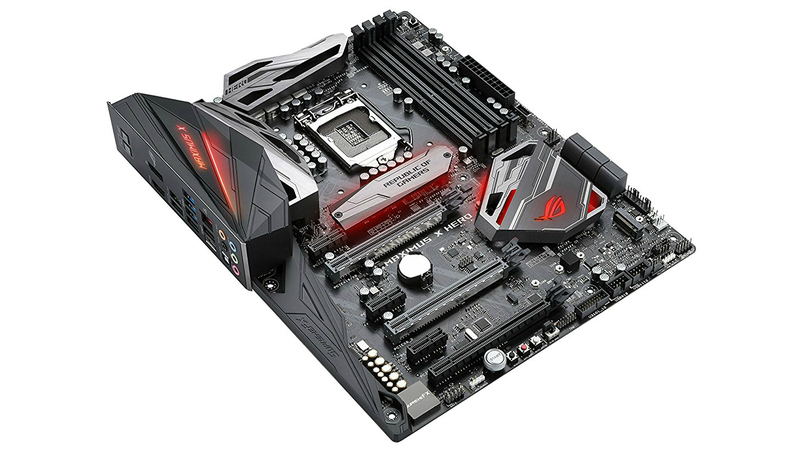 There aren’t a great many reasons to go with the X470 chipset instead of X370 – all Ryzen CPUs will work with both – so if you do opt for one of the newest AM4 boards, it might as well be something as bold as the X470 Aorus Gaming 7 WiFi. It’s brimming with both flashy styling (RGB lighting is present throughout) and high-end connectivity, right down to the cooling headers – a whole eight, so elaborate open-loop watercooling systems are possible. Three PCI-E slots, meanwhile, allow for both Nvidia SLI and AMD Crossfire setups in dual- or quad-GPU configurations, and there are two M.2 slots – both with their own detachable heatsinks, which can help prevent throttling on the installed drives. The rear I/O panel is particularly outstanding. Nine full-size USB ports is about as good as you can expect at this price, and that includes two USB 2 ports, four standard USB 3 ports, two USB 3 DAC-UP ports (for connecting to hi-fi equipment) and a single USB 3.1 port. On top of that, you get a reversible USB Type-C port and a full assortment of alternative audio connectors, including an S/PDIF output, 3.5mm rear speaker and C/SUB outputs and the standard line in, line out and microphone jacks. Accompanying it all are antenna mounting points for the integrated 802.11ac module – another highlight, especially since it also provides Bluetooth 5.0 connectivity. This is also a good motherboard for beginner overclockers, as leaving ‘EZ Overclock Tuner’ engaged also means the BIOS does a decent job of self-adjusting voltages. We used this to easily push a Ryzen 7 2700X from its 3.7GHz stock speed to 4.15GHz, without any subsequent issues. 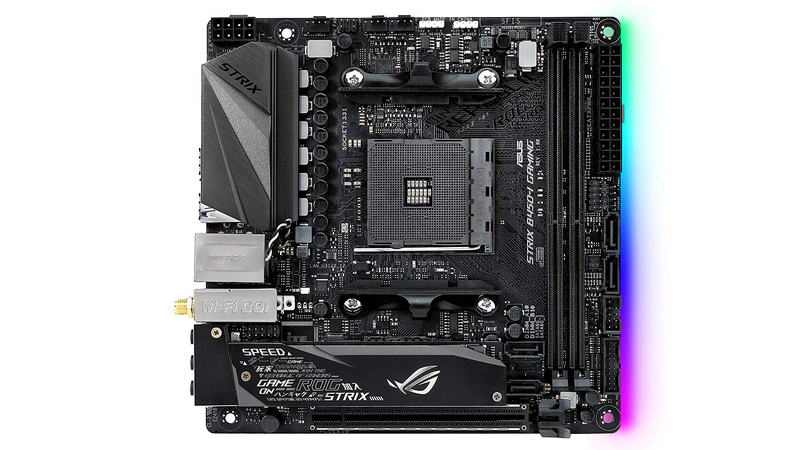 It’s another ROG Strix board, which means it’ll be more expensive than an Asus Prime equivalent, but for a mini-ITX motherboard this is absolutely stuffed with the connectivity and upgradability that makes a good PC great. There’s a heatsink-equipped M.2 slot, multiple RGB headers, two fast USB 3.1 ports (in addition to the four USB 3 ports), built-in 802.11ac Wi-Fi and Bluetooth 5.0, which would be a good feature lineup on a lot of much larger motherboards. Asus has also snuck a secondary M.2 slot on the back, which is a deft workaround for the limited board space to the front. It’s also remarkably well-built. Motherboards don’t vitally need to be super strong (it’s not like they’re mobile tech) but there’s something reassuring about how solid and attentively-crafted the ROG Strix B450-I feels in the hand. 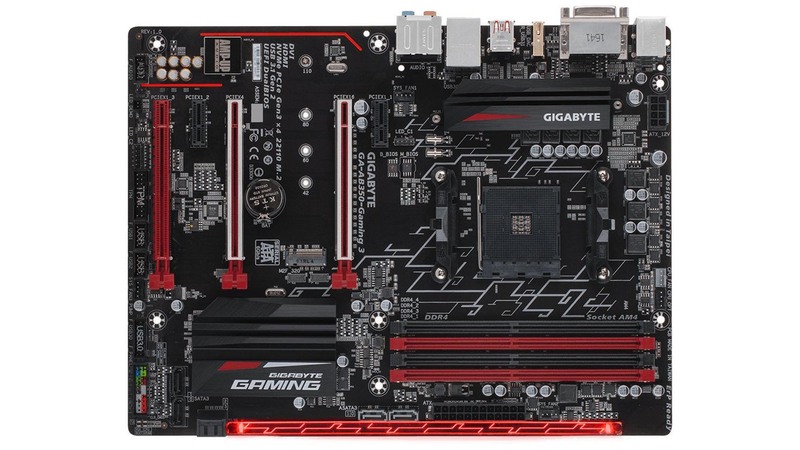 The micro-ATX Gigabyte AB350M-Gaming 3 isn’t quite as small as a mini-ITX board, but it offers everything you need to build a compact overclockable system, and the price is hard to beat. There are a few design compromises, but they’re not too bothersome. You get Realtek’s ALC887 codec instead of the newer, better-performing ALC1220 codec, and just three audio jacks on the rear I/O panel. There’s also only two PCI-E x16 slots and a single PCI-E x1 slot – and the latter could be blocked by your graphics card, depending on the size of the cooler. Overall, though, connectivity is pretty decent. You do get two USB 3.1 Type-A ports, four USB 3 ports and two USB 2 ports, along with several video outputs to support future AMD processors with integrated graphics. Inside there’s an M.2 slot for fast SSDs, and six SATA ports too, which should be more than enough for a budget system. One good point for enthusiasts is the fact that you get the same software and UEFI system as on Gigabyte’s more expensive boards. We found it easy to hit 3.9GHz across all our Ryzen 7 1700’s cores, increasing overall performance by 15%. In all, the AB350M-Gaming 3 is a great choice for a compact AMD system. It won’t fit inside a tiny ITX case, and it lacks a few bells and whistles – but for £80 it’ll serve as the foundation of a very capable modern PC, and that’s not to be sniffed at. You don’t strictly need to splash out on the latest Intel Z390 chipset, even for high-end overclocking. Z370 boards will work with the same CPUs, with Z390’s main advantages being built-in support for 802.11ac Wi-Fi and USB 3.1 ports without the need for additional controllers. Even so, the MPG Z390 Gaming Edge AC is a fantastic ATX motherboard that’s also very attractively priced. Integrated Wi-Fi and Bluetooth 5.0, an optical S/PDIF audio output, USB Type-C, reinforced PCI-E slots and RGB lighting makes for a high-end feature list that wouldn’t be out of the ordinary for a £200-plus Z370 model, never mind a cheaper Z390 board. It’s not the absolute best for overclocking, as we could only push our Intel Core i9-9900K to a fairly modest 4.9GHz all-core speed before instability crept in. An even more premium motherboard, like Asus’ ROG Maximus XI Hero WiFi, might get you better results. MSI’s UEFI design, however, remains our favourite among the major manufacturers for its ease of use.